Catholic Store providing Lourdes Water, Rosary Beads, Miraculous Medals and a large collection of the best Catholic Gifts. Our fine range of quality and unique Religious Goods and Catholic Jewelry can be sent to any location worldwide. We pride ourselves on providing a very reliable worldwide shipping service, which includes delivery to Australia, Canada, UK, USA, South America, Asia, Europe and Africa. When shopping on our site, wherever you would like your Glorious Bernadette or Lourdes pilgrim gifts sent to, we will send them! Glorious Bernadette it would only be by a miracle that I would ever travel to Lourdes, so I appreciate having a little bit of Lourdes come to me. Thank-you, you have no idea how much this means to me. 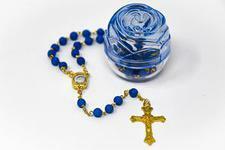 I recently placed an order for five items with your beautiful Catholic Store. I have received them this morning and they are lovely, thank-you. I will definitely be ordering more Catholic Goods from you very shortly. I just wanted to write and thank you for all my beautiful items - it is a joy to open the box and unwrap all the Lourdes treasures inside, especially the Rosary Beads and Miraculous Medal, it is lovely. I also received two extra prayer cards and a wooden all saints bracelet! Goodness, what kind and generous loving souls you are. I will be constantly buying from you, because each gift brings me closer to the Divine Holy Mother. I feel blessed to hold some of the miraculous water in my hands. God bless you and thank-you for making these gifts so beautiful to open. I feel like I'm at Lourdes, even though I've not had the pleasure of actually being there. Thank you so much! I received my order of Catholic Goods yesterday and I am so excited to be able to buy Holy Water from the Lourdes Grotto, in this way. Thank you for offering this wonderful service. I will be sure to order more gifts again in the future. Mr & Mrs B, Ontario, Canada. I received my wonderful package of Holy Water Bottles earlier today. The Catholic Products were beautifully packaged and I am very pleased with the quality of your Catholic Gift Shop. I even cried when I opened the package and held the water in my hand. Thank-you very much for the very quick service and my free gift of Lourdes Holy Water Mints. I am sure that my Mum will be very happy with these Catholic items on her birthday. God bless you all and make sure you keep up the good work. 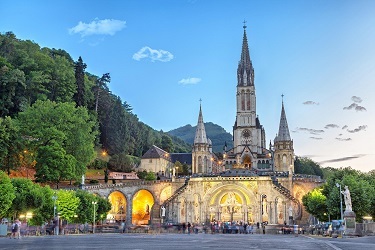 Thousands of unexplained healings and miracles have been recorded and associated to Lourdes water and Glorious Bernadette, since the first recorded Lourdes healing, which occurred at the grotto on March 1, 1858. Many people bottle the miraculous water to keep for themselves. They also give the bottles of holy water as gifts, to loved ones and give the water to help cure the sick. We have a large selection of Lourdes Water Gifts to choose from.